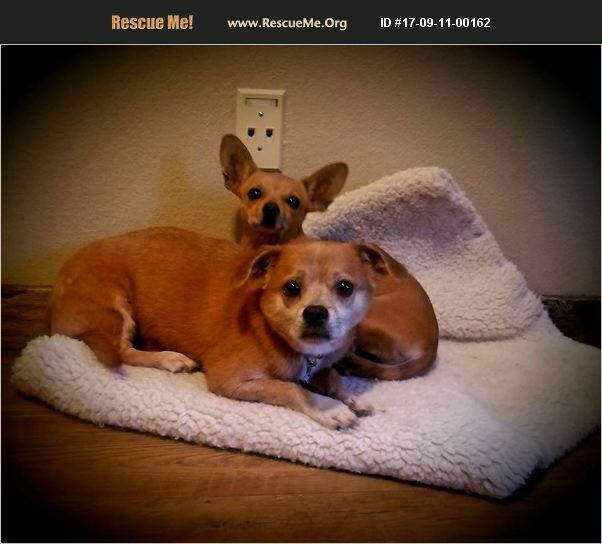 Meet Ratio and Angel, they are a bonded pair of Chihuahua's looking for a furever home together. They are approximately 9 years old, and have been together since they were puppies. Ratio is a male and Angel is a female. They were adopted at puppies and grew up together, they have been apart. The family who adopted them got tired of taking care of them and put them in their car and parked at the local park and offered them to anyone who would take them. People walked by, but no one paid any attention to them. One person stopped to ask questions and she was told that the family no longer wanted to have dogs and if no one took them they would be dropping them at the local shelter. When they were told the shelter would most likely put them to sleep, the family did not care. They said that would be ok. The family was asked how could you do that to two little dogs who have given you unconditional love for the past 9 years, the family said it was no big deal people do it all the time. The lady looked into the trunk of the car where Ratio and Angel were and they looked like they had not been taken care of in a long time. They had long toenails and were starving for attention. The lady decided that she would take the two and help them find a new home where they could find a little love and attention. Ratio and Angel are two of the sweetest little Chihuahua's you could ever meet. They do have a few misgivings, as all dogs and humans have. They don't like kids, the family who had them had kids and we think the kids were not nice to them and therefore they cannot be placed in a home with kids. They also don't like cats, but there are plenty of dogs that don't like cats. Ratio does protect little Angel and that must come from how they were treated before. Other than that, they are very snuggly, sweet and loving. They absolutely love going for walks and getting exercise outdoors. They are rather quiet, rarely barking. They are ok with small dogs but big dogs scare them. Ratio loves little Angel so much that he will take a mouth full of food to her and drop it on the bed so she doesn't have to get out of bed. They are not on any special diet and both are very healthy. They are up to date on all their vaccinations and spayed and neutered. They are being fostered in Elizabeth, CO. Please email for an application if interested in meeting them.